It takes pictures. But it doesn’t give them back. I tried two different cords and two different computers. It taunts me by saying, “Yes, I’m connected”, then it says, “Fooled you” and turns itself off. Hyperventilate Mumble. Mumble. I had some good pictures on that camera–like the animals enjoying the wonders of the Sacred Banana and my knitting and the ongoing saga that is my kitchen. 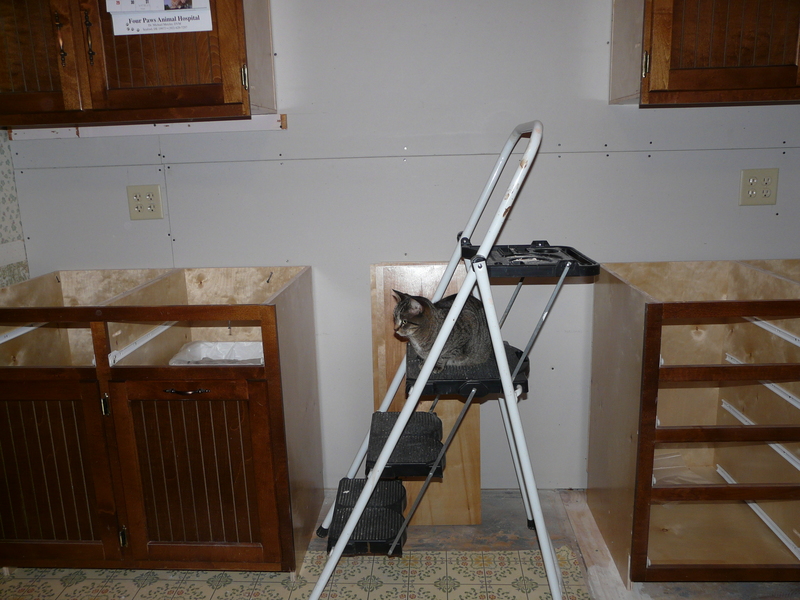 Frank has been doing a great job on re-purposing the old cabinets. 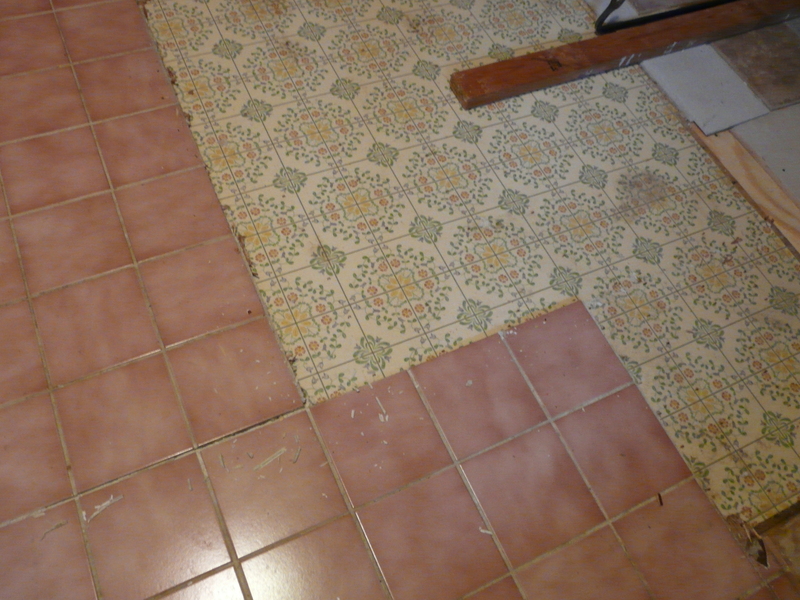 And with the old stove gone, the floor can be finished. 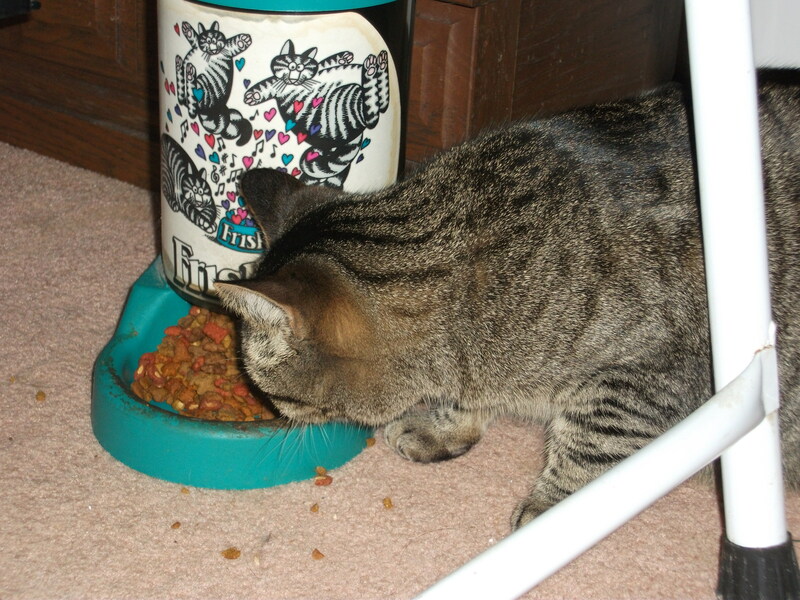 We keep moving the chow, but the cats still manage to find it. For a good month now, I have managed to avoid Sweetums’ cold. But, it’s finally got me, right in the chest. This can’t be happening. I’ve got things to do. Everything is such an effort. Since it was raining, I took a shower this morning and washed my hair. Usually I feel great afterward. Today, I was exhausted by the time I was finished. I could just beat him. 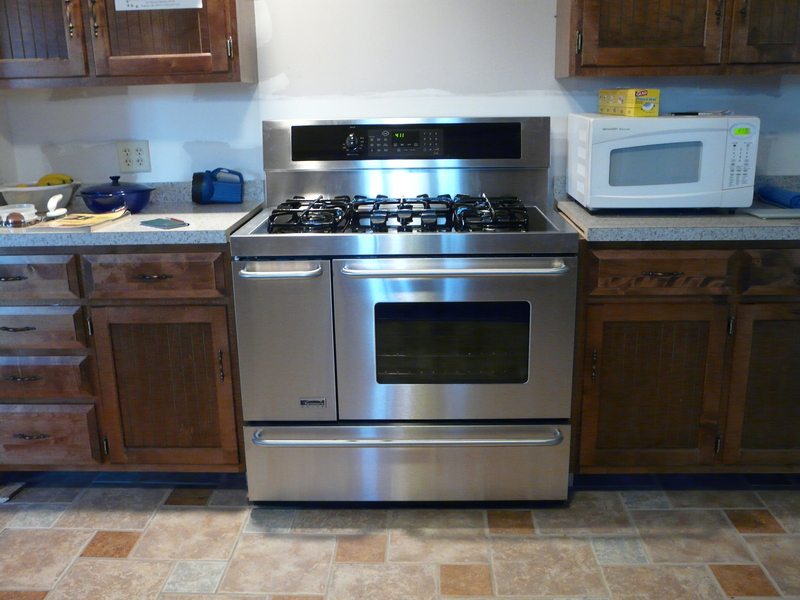 It has gas burners and electric ovens. That’s all I really wanted. But we had a 42″ space to fill, so we bought a 40″. It has five burners with three different BTU. There is a small oven that my favorite baking dish fits into nicely. The main oven has more programing options than I will probably ever use, but I’ll have fun trying. What can I say? I like to bake. One thing I don’t like; it’s stainless steel. I think stainless steel is highly overrated. I’d be happier if it was white or almond or almost any other color–even blue, but that’s life. Anyway, I really do love it! Oh! I forgot to mention it’s also convection and self cleaning. Why am I sitting here when I should be playing with my new toy? We’ve been going out for supper the last three days and I’m hoping we won’t need to today. I thought about putting something in the microwave, but Sweetums said, “Let’s just get a burger.” I guess a microwave meal didn’t appeal to him either. Frank cut off the peninsula next to the stove. It’s surprising how much that opened the room. 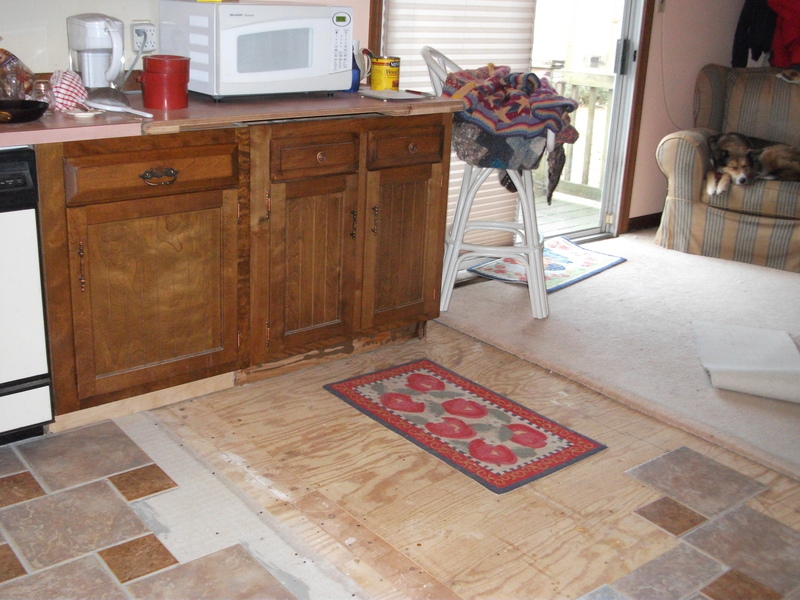 The floor should be finished today. Well, it’s not really finished. Another section still needs work. 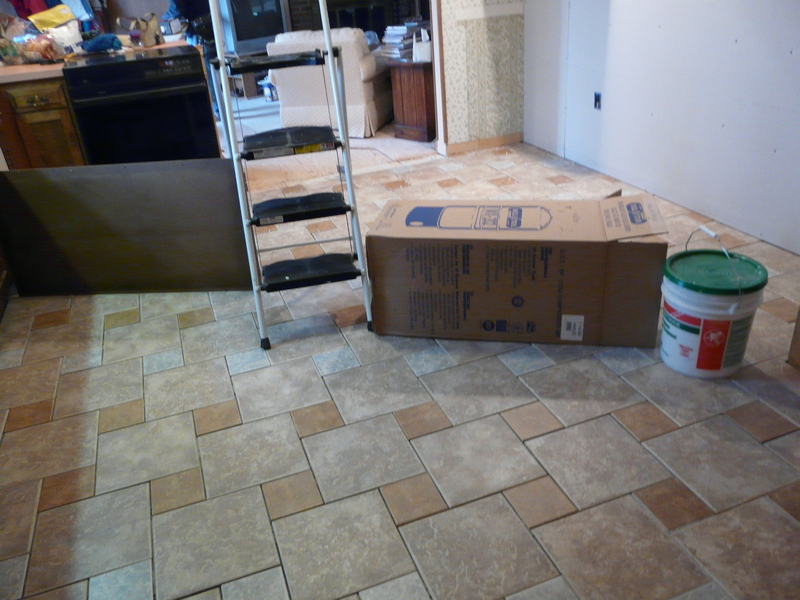 The current stove goes and the new floor needs to be extended, hopefully, to the back door. I always thought carpeting there was stupid. We are going to get a dual fuel range. I really miss cooking with gas and an electric oven cooks so evenly. I’m so glad we didn’t have a granite top on the side cabinets. It sawed in half very nicely to make room for the new range. Flo, as usual, has been helping. And I thought the pink floor was ugly. And this was on the wall? I found this is the dining room. 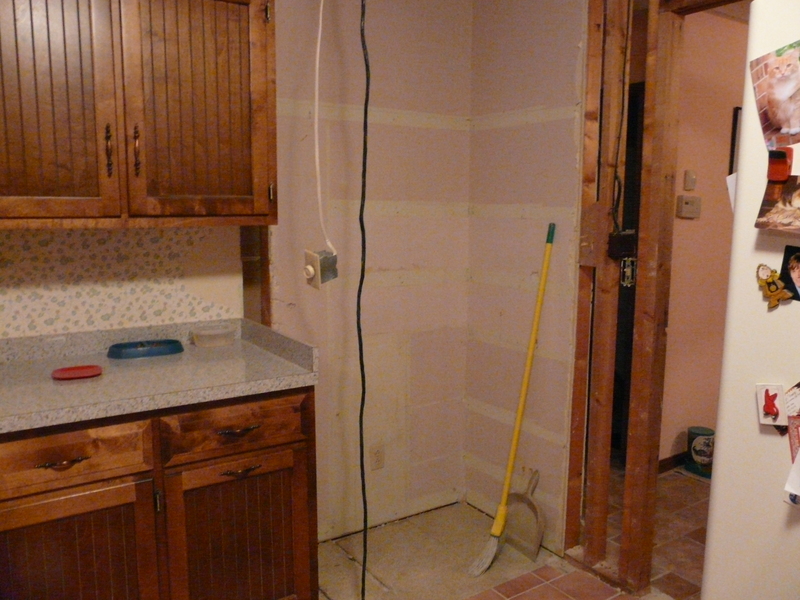 Frank came yesterday and they started removing the wall between the kitchen and what’s left of the dining room. So, of course, stuff had to be moved. And, since I did not help in this process, I can’t find anything. Why didn’t I help. I had more important things to do. I got a pedicure and a haircut. You know–the necessities of life. 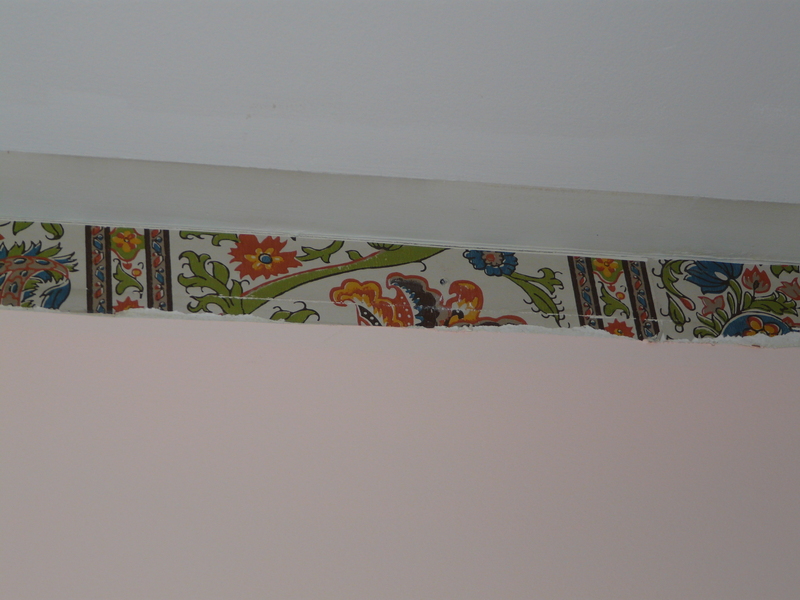 It is so strange to get something out of a cupboard and the cupboard isn’t there. You just stand for a few seconds with this dumb look on your face. Then Sweetums says, “What do you want? I’ll get it for you.” See why I call him Sweetums. Supper was a bit of a challenge. Posted in Family and Friends | Comments Off on I Can’t Find ANYTHING! !